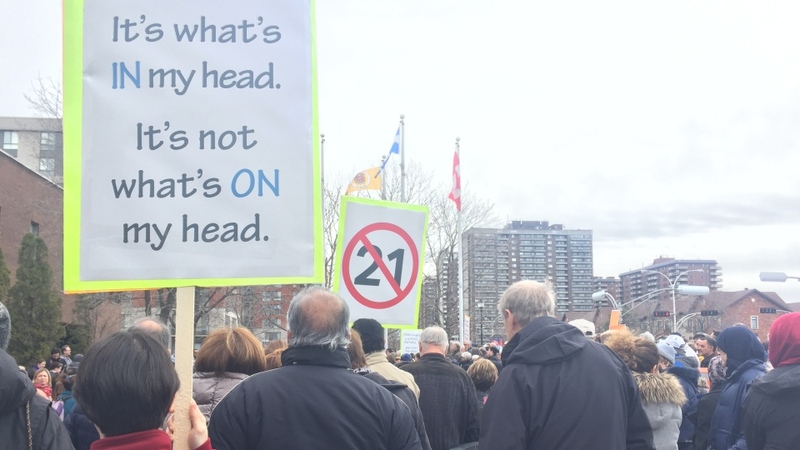 Joined by federal, provincial and municipal politicians hundreds of Montrealers protested the National Assembly’s controversial religious symbols bill at two rallies on Sunday. The protesters denounced the bill, which would ban public employees in positions of authority from wearing religious garb such as hijabs, kippas and turbans, as discriminatory and unconstitutional. Around 200 people were present for a demonstration in front of a Cote-St-Luc community centre. Among them were five federal Liberal MPs who said politicians have a duty to stand up against a bill that threatens what they called fundamental rights and freedoms. They also denounced Premier Francois Legault’s decision to use the notwithstanding clause to block any potential legal challenge, saying the public should at least have the right to know if a bill is unconstitutional. Liberal MNA for D’Arcy-McGee David Birnbaum also was in attendance, saying that Bill 21 goes against true religious neutrality. A separate protest held at Place Emilie-Gamelin attracted roughly 500 people. Among them was philosopher Charles Taylor, co-author of a 2008 report on reasonable accomodations for minorities in Quebec. "We basically didn't believe that secularism involves denying people's rights," he said. "This bill is trying to translate secularism into saying to certain people 'You can't have certain jobs or careers,' and that's absolutely unacceptable." Premier Francois Legault commented on the furor over the bill, saying he believes the legislation is fair as anyone who currently holds a job and wears a religious symbol would still be permitted to do so should the bill become law. "At this point, we've already made compromises. I think the grandfather rule will make sure nobody will lose his or her job right now. I'd like for this debate to be done in a respectful way."